I believe in telling the story of wine, whether through a creative and thoughtfully written wine list, on the floor talking to guests or through a magazine article. As a wine professional, I am committed to elevating the quality of wine and wine service in this country. As a reporter for NBC New York in Manhattan, I began interviewing Sommeliers and thinking about wine as a professional and not just a consumer. I learned about the concept of terroir and was immediately converted. 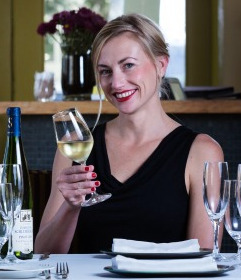 San Francisco Magazine, June 2015, "Drinkers without Borders"
A graduate of The Culinary Institute of America's prestigious Accelerated Wine and Beverage Program and Certified Sommelier, Courtney has worked in viti- and vini-culture in Northern California, contributed to Decanter (as a regular news correspondent), The World of Fine Wine (where she was honored to be recognized among the best wine writing for the last 10 years), 7x7 Magazine (as a wine and spirits columnist), the San Francisco Chronicle and SOMM Journal. As the Wine Director and Sommelier for Charlie Palmer's Dry Creek Kitchen in Healdsburg, she over-hauled the wine program to elevate the guest experience and tell the story of the local wine industry in a more creative and engaging way. When the Executive Chef, Dustin Valette left to open his own restaurant across town in early 2015, he recruited Courtney to create and guide his wine program. Valette was later recognized as one of the top wine restaurants in the country. Courtney has served as a judge twice for the international competition Concours Mondial and has traveled internationally in pursuit of terroir.